On Chrysler LX vehicles, Under hard use, even the beefed-up SRT power steering system can blow. Literally. Track drivers have experienced split hoses and pumps that literally blow off the car and leave parts on the track. All due to superheated fluid. If you are going to track one of these cars you must take extra steps to cool the power steering fluid. The transmission and engine oil coolers benefited from cooling systems with mechanisms built in that slowed the travel of fluid across the cooler to improve its efficiency (turbolators). With a power steering system, you don't want that at all. You need free flow. The stock coolers are tube-and-fin affairs that, even in their extra-large SRT factory versions, are inadequate. Plus, the space taken up by this cooler in the factory configuration is now crowded into by the auxiliary transmission cooler. While its possible to sandwich in a bigger tube-and-fin cooler, its hardly desirable. For this job, a heat sink cooler was chosen. In this case, the largest heat sink that could be found. Over two feet long with fins both on the inside and the outside, the system's cooling capacity was bolstered simply by the fact that the cooler holds over a quart of fluid. Heat sink coolers work well without being in direct airflow. Its not unusual to see them mounted to a vehicle's frame, tucked up high somewhere. However, in this case it was possible to mount the cooler high up and directly behind the grille, in direct airflow. The parts list for this one is especially short and inexpensive. The list below does not count the two clamps you will need, and this particular installation simply re-uses the existing stock factory hose. 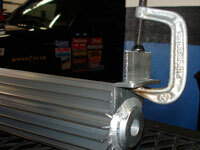 Installation does require a bit of special fabrication work. To enable attachment to the upper fascia supports as shown, some additional fittings need to be welded onto the existing support brackets. The brackets have to be welded on at a slight angle. Fitment was accomplished by c-clamping the cooler to the desired location, marking with a pencil the line where the support to be bolted onto was, clamping a sized aluminum strip to this location and welding it on. 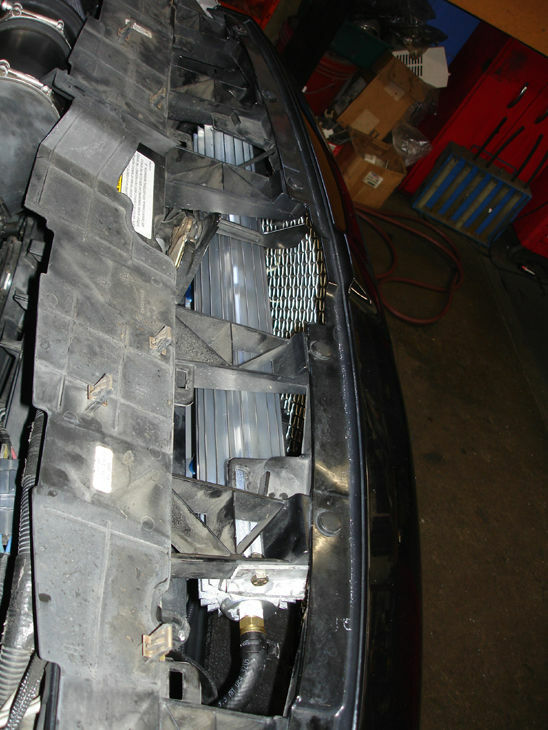 A simpler installation is possible by simply bolting the cooler to the bottom of the bumper, where it will be fed quite nicely by air coming in from the lower grille. However this is only feasible if you are not installing the stacked-plate oil cooler. While no one using this cooler has plumbed in a temperature sensor to determine it's precise effect on temperature, it appears to be 'good enough' as vehicles with it installed have never had their power steering system blow up, unlike stock configurations.